The LEGO offers a robotic set called LEGO MINDSTORMS. Series Lego Mindstorms contains several versions. The first version is LEGO MINDSTORMS RCX. Another version is called LEGO MINDSTORMS NXT. The latest version is LEGO MINDSTORMS EV3. The Cpp4Robots extension supports just the latest version Lego Mindstorms EV3. The basic element of Lego Mindstorms EV3 is EV3 Brick. The EV3 Brick contains a 32-bit ARM processor(ARM9 300 Mhz). Flash memory is 16 MB and RAM memory is 64 MB. The operating system is Linux. 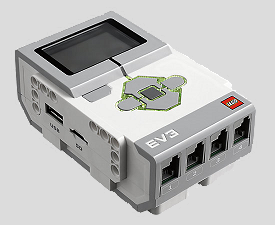 The EV3 Brick also includes a Micro SD card reader. And just for development with Cpp4Robots extension is SD card recommended. You can not start your application directly from EV3 Brick without SD card. Download application into EV3 Brick will be much faster with SD card(It is possible to use compression). Format : Micro SD card - Supports SDHC. Version 2.0. Max 32 GB. Communication of Cpp4Robots extension with EV3 Brick is accomplished through the USB cable or bluetooth connection. It is also planned WiFi communication in the future. This extension works with default firmware in EV3 Brick. Version of firmware has to be 1.03H or higher. You do not need to upload any special firmware into EV3 Brick. The extension uses the custom API to development of applications. How to show Lego EV3 Toolbar? Description of Lego EV3 Toolbar. First application for Lego EV3.